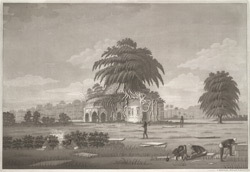 Aquatint with etching by James Moffat, of the Chamkatti Mosque at Gaur, dated 1805. Gaur was an ancient capital of the rulers of Bengal. It came to prominence under the Buddhist Palas from the eighth century, and then prospered under the Hindu Senas from the twelfth century. It fell to the Delhi Sultanate in the thirteenth century and later served as the capital for the independent Sultans of Bengal from the mid-fourteenth century till the sixteenth century, except for an interval between 1354 to 1442 when neighbouring Pandua was made capital. Gaur was relinquished to ruin and decay by the end of the sixteenth century. Various monuments remain from the later period of sultanate rule from the capital. Part of the fifteenth-century fort remains along with its much ruined gateways or 'darwazas'. There are a number of both congregational and local mosques including the tribal Chamkatti Mosque (c.1478), a small building with a single dome and a vaulted verandah to the east. It used to be decorated with glazed tiles and terracotta reliefs. According to the inscription local tradition in the nineteenth century held that the mosque's name, 'Chamkatti' or 'Skincutters', refers to a group of religious ascetics who cut their skin, possibly as part of esoteric practice, with whom the mosque was particularly associated.